Hallowell Metal/Wood Hybrid Single-Tier Lockers combine the durability of steel with the attractiveness of furniture-grade red oak plywood. The wood door features a built-in cylinder cam lock and key so your belongings stay protected from theft. Hang coats and bags on the two single-prong side hooks or the convenient steel coat rod. Place smaller items like electronics on the top shelf. Hallowell Metal/Wood Hybrid Single-Tier Lockers are GREENGUARD certified and made in the USA. Backed by a one-year warranty. Looking for unique lockers? 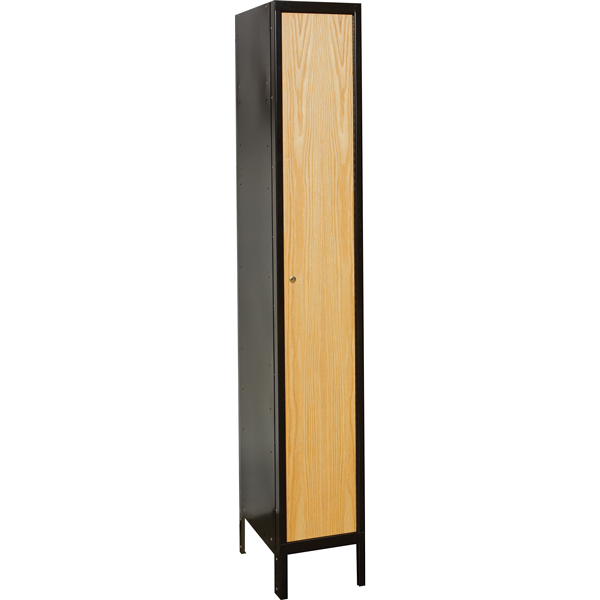 Hallowell Metal/Wood Hybrid Single-Tier Lockers combine the durability of steel with the attractiveness of furniture-grade red oak plywood. The wood door features a built-in cylinder cam lock and key so your belongings stay protected from theft. Hang coats and bags on the two single-prong side hooks or the convenient steel coat rod. Place smaller items like electronics on the top shelf. Hallowell Metal/Wood Hybrid Single-Tier Lockers are GREENGUARD certified and made in the USA. Backed by a one-year warranty. Call us at (877) 839-3330 for assistance with a quote or order.